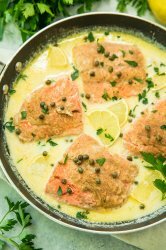 This Creamy Salmon Piccata is a quick and easy one pot meal that is on the dinner table in 30 minutes! Perfectly pan seared salmon in a creamy lemon sauce that the entire family will love! 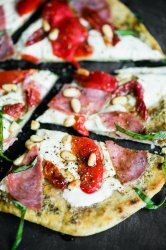 We love a good pizza, and this Rustic Flatbread Pizza has everything you could possibly want. The homemade garlic herb crust is super simple to make and bakes up to crisp and flavorful perfection. 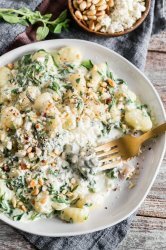 The perfect creamy dish for Meatless Monday or throw on a little grilled steak to take it to a whole new level of protein packed deliciousness. Chicken meatballs, a little help from Alessi's marinara sauce and everything cooked in one pan? Now that leaves me speechless. Old Fashioned Glorified Rice is a creamy dessert with marshmallows, strawberries, pineapple… and rice! 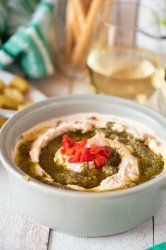 A unique no-bake recipe for summer picnics. Looking for a delicious summer meal? This Grilled Flank Steak with Porcini Mushroom Pilaf will make you look like a superstar chef! I love any kind of pasta and even better when it is very easy to make. We bring you this absolutely delicious one-pot pasta recipe which includes a delicious meat sauce. This pizza comes together in a little over 30 minutes and makes for a satisfyingly quick vegan weeknight meal. These deliciously easy desserts are perfect for any dinner. Quick preparation and beautiful presentation make this a great dessert to impress.